Candidates who have qualified in the UPSC Prelims Result are now eligible to appear for Civil Services (Main) Examination 2016. UPSC had conducted the Civil Services Preliminary Examination 2016 on 07 August in two phases. The first phase was held from 09.30 am till 11.30 am and the second phase was 02.30 pm till 04.30 pm. Civil Services (Main) Examination will be held on 03 December 2016. Qualified candidates are required to apply again by filling up the Detailed Application Form (DAF) for the Main Examination. The DAF will can be filled from 07 October till 20 October. Likewise, Indian Forest Service (Main) Examination will be held from 12 November 2016. The DAF for the same will be available from 21 September till 06 October. Candidates should note that important instructions and guidelines for filling up DAF will be available on the official portal of UPSC. 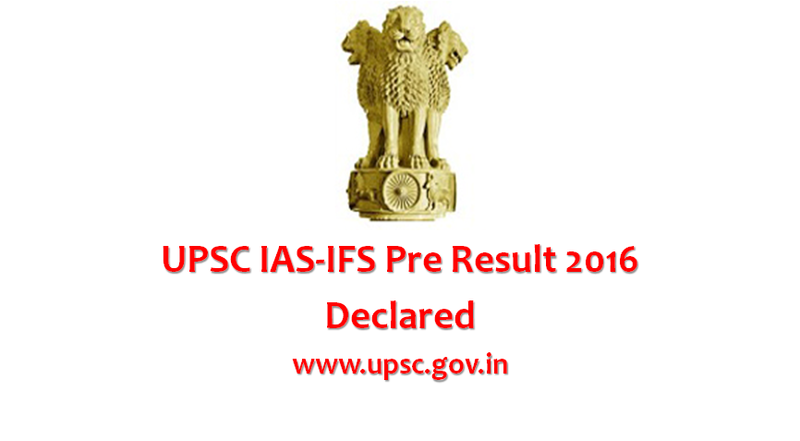 Candidates are also informed that marks, cut off marks and answer keys of screening test held through CS (P) Examination, 2016 will be uploaded on the Commission website i.e., www.upsc.gov.in only after the entire process of CS(M) Examination, 2016 is over i.e. after the declaration of final result of Civil Services Examination, 2016. About UPSC Civil Service Examination: Union Public Service Commission conducts Civil Service Examination every year to incorporate fresher talents into the administrative root of the country. Considered to be one of the toughest examinations, every year lakhs of applicants submit their application to appear for the exam. The Commission tests candidates on preliminary, main and interview level.